Politico influencers list: Includes humans of actual influence. 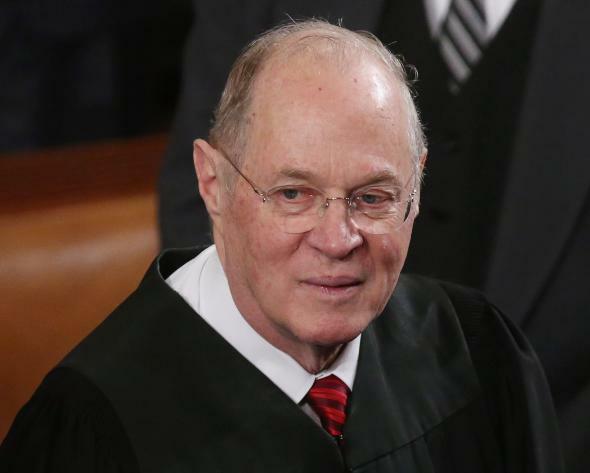 Supreme Court justice Anthony Kennedy, the world’s most important celebrity, at the 2013 State of the Union. Every year Time magazine puts out a list of the world’s 100 most influential people and throws a party in New York to celebrate it. An then every year everyone looks at the list and the pictures from the party and says, “Huh?” Because while there are always defensible and informative choices involved—in 2014, Bill Gates made a case for Nigerian businessman and philanthropist Aliko Dangote, for example—the useful picks are overshadowed by such dubiously relevant honorees as 2015’s Bradley Cooper and 2014’s Christy Turlington. This is not to say culture and entertainment figures can’t be influential, it’s just that, by any possible measure, and I have nothing against them personally, there is no way that Bradley Cooper and Christy Turlington are among the 100 most important people in the world. They are among the 100 most famous people who might show up at a red-carpet thing that will help Time maintain its brand presence in a media environment that’s not been kind to legacy magazine titles. But to the type of person who cares about such things (i.e., a pedantic nerd who writes for Slate), it’s annoying to see a journalism outlet whose ostensible purpose is making true statements about how the world works make such blatantly false statements in service of its dubious corporate buzz strategy. Anyway, my point here is that Politico has put out a list of the 50 most influential people and groups in American politics and that Politico’s choices informatively illuminate the origins of our national state of affairs and that if you read it you will become a better citizen without having to waste your time on anodyne rich-person back-scratching like this totally inessential Time blurb about Lorne Michaels by Jack Nicholson. No. 1 on Politico’s list is Anthony Kennedy, swing voter on so many historic Supreme Court cases; sharing the No. 2 slot are Citizens United President David Bossie and campaign finance lawyer Charlie Spies, whom Politico credits with creating the model of post–Citizens United super PAC funding in his work for Mitt Romney and Jeb Bush. Other choices get into the ideas and decisions behind such trends and events as the decline of coal power and the decision to put a woman on the $10 bill. My only criticism is that I probably would have put Obama on the list because, like, I know it’s so obvious, but he’s the president. See the whole list here.